Send this Noble Grandeur Gourmet Gift Basket to help a favorite friend or loved one to savor life’s special moments. 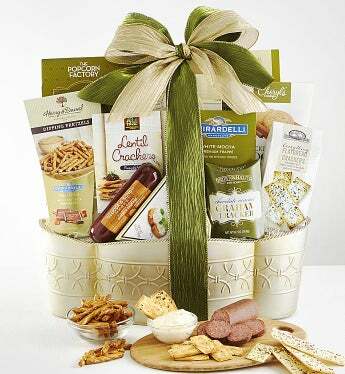 They’ll love the metal embossed basket filled with Ghirardelli® White Mocha Beverage Mix, Lucca & Sons® Garlic Summer Sausage, Gouda Cheese Spread, Harry & David® Dipping Pretzels and so much more! They’ll absolutely adore it – and you!